ClosetMaid Decorative Storage line of cube organizers takes storage and organization to the next level. Add 1 of these stylish pieces to any room of your home. The Decorative Storage fabric bins are a great accent for these units and designed to match perfectly together. The ClosetMaid Impressions 25 in. Deluxe Drawer Kit features a premium embossed walnut finish with a decorative panel front and stylish metal handle. The full-extension ball-bearing glides offer smooth operation and provide easy access to clothing, while the durable laminate construction ensures lasting use. This drawer is designed to fit with the ClosetMaid 4-Shelf Organizer or Closet Kit (both sold separately). ClosetMaid 12 in. W x 31 in. H Decorative White 3-Cube Organizer ClosetMaid Decorative Storage line of cube organizers takes storage and organization to the next level. Add 1 of these stylish pieces to any room of your home. The Decorative Storage fabric bins are a great accent for these units and designed to match perfectly together. ClosetMaid 12 in. W x 31 in. H Decorative White 3-Cube Organizer is rated 3.0 out of 5 by 2. Rated 5 out of 5 by Sunshine23 from Very functional and inexpensive This product was very easy to assemble, good size, good weight, all the holes matched. It is very functional as an organizer for the closet. I bought two of them and put them side by side under a shelf panel against the narrow side of the closet...fits well! Excellent shelf to stack t-shirts, camis, shorts, pants, and handbags...belts and scarves can sit on the top of the unit. So, it is sturdy enough for these purposes. This unit would work well in a small bathroom too. Yes, the screw covers don't fit well. I made the bottom of the stem narrower and hammered them in with the back of the screwdriver. You don't really need these for the closet though. I almost didn't make this purchase after reading the first review. 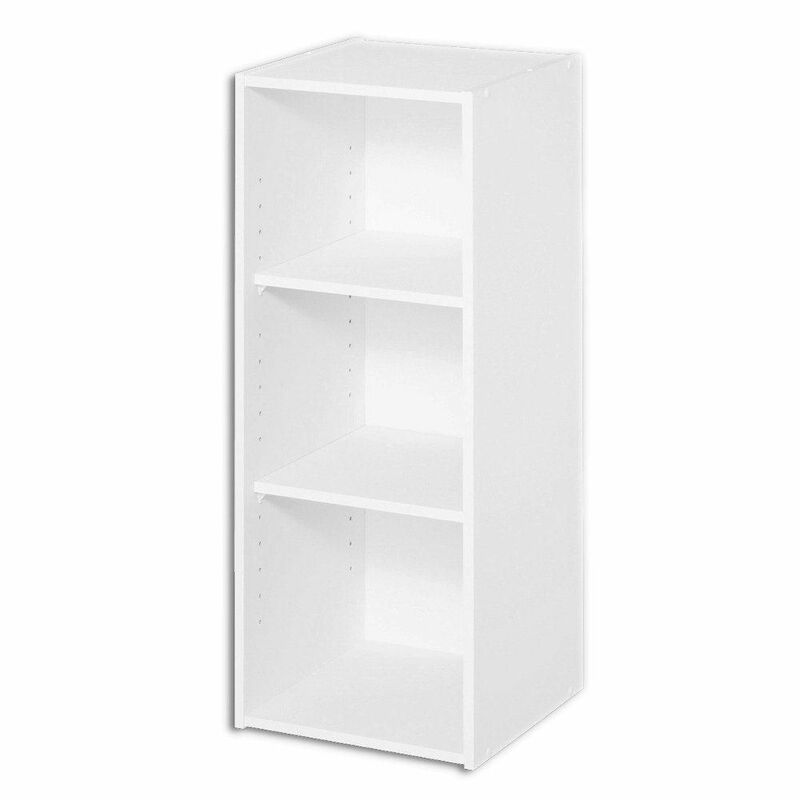 However, I read all the positive reviews for model 707017 which is basically the same organizer as this one but without the bottom shelf. Then, I went into Home Depot to look at it. I wouldn't hesitate to purchase more of these. Rated 1 out of 5 by Blarg from Terrible Put it together and middle shelves weren't wide enough and the caps to hide the screws don't fit. Wasn't expected much for $25 bucks but at least the shelves could fit so you know, you could put stuff on the shelves. Returning it tomorrow together because i hammered all the nails in for the backing and if I take them out it'll probably damage it. What are the actual dimensions for the assembled product. There see to be 3 different ones provided. for eg. Height: 44 inches, 13 (interior dimension of cube) X 3 would be about 40- 41 inches, and 31 inches.